Even though Android and iOS have emerged as the preeminent smartphone operating systems, there will always be a one mainstay that refuses to kick the bucket: RIM and their Blackberry OS. There’s a big reason why people are still tethered to these phones, even though most new devices by other companies blow them out of the water. 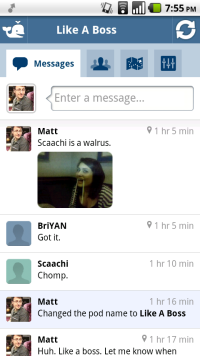 It’s one little application: BBM. Blackberry Messenger is important to the brand’s survival: it is free phone-to-phone communication tied into a PIN number, rather than a username. More importantly, it’s on every Blackberry. This means that there is nothing to bug your friends to install, or more importantly use. However, the app does what it advertises extremely well: Beluga’s interface is sleek on both platforms, and allows users to group their contacts into “pods” which then can be communicated with instantly. 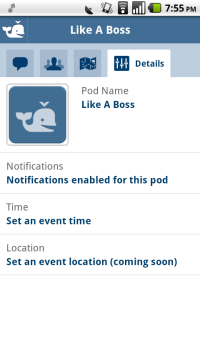 You can provide image and location-tagged messages, and members of the pods are updated on-the-fly. It’s simple, and works; I had no hiccups testing it. Beluga also takes some time to try to tackle the user base problem, as well. When you sign up, you are required to tie your account to your phone number. While I was initially apprehensive about this, I realized its greater purpose: automatic contact sharing. What Beluga does is query your phone book for any numbers that are on the system. When it detects a match, it automatically notifies you that person X is also using Beluga, and vice versa. When I asked a couple of my friends (pictured above) to use the service along with me, there wasn’t any questions of what their Beluga username was; as soon as they signed up for the service and their number was entered into the database, my app let me know. I cannot stress how great that is. However, the reason I won’t keep Beluga on my phone is the same reason I won’t join Facebook-alternative Diaspora: none of my friends use it, and trying to convince them is not worth the effort. If I had to convince all the Android and iOS users I know to install an app, coach them on how to use it, then hope they all check it once and awhile, I would have to wonder why I wouldn’t just call/SMS them in the first place. I mean, their contacts are already in my phone! I have the same apprehensions with BBM: I don’t understand the appeal of “instant.” My friends tell me it’s big amongst professionals, where time is money; others tell me it’s comforting to know that while texts can be ignored/lost/unread, BBM lets you know that your message has been sent/received. All I know is that its success is largely because of the fact that everyone uses it, and if a phone would otherwise be cast off if the feature was omitted, then there has to be something to it. If you have enough people in your network of contacts using Beluga, I’d say go for it; it really is an amazing app. However, if you’re like me and only have one or two people that would actually use it, you might find that Beluga’s downfall is one that has nothing to do with the way it’s coded. 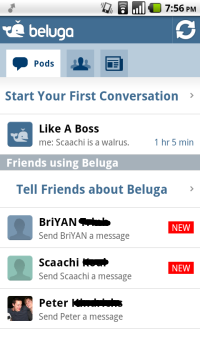 You can download Beluga for Android here. Matt Demers is Droid Life’s app guy and feels it’s a bit hypocritical telling people that instant doesn’t matter when he’s such a Twitter addict. You can give him tips to things you want reviewed by following or e-mailing him.